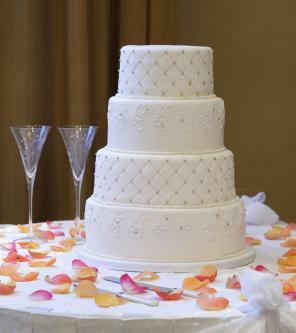 Quilting the icing on your wedding cake is an elegant way to add texture and interest. Quilting can be applied using multiple techniques and presented in several different ways depending upon the final look you desire for the cake. This quilting method can be modified to enlarge or shrink the size of the quilting pattern. 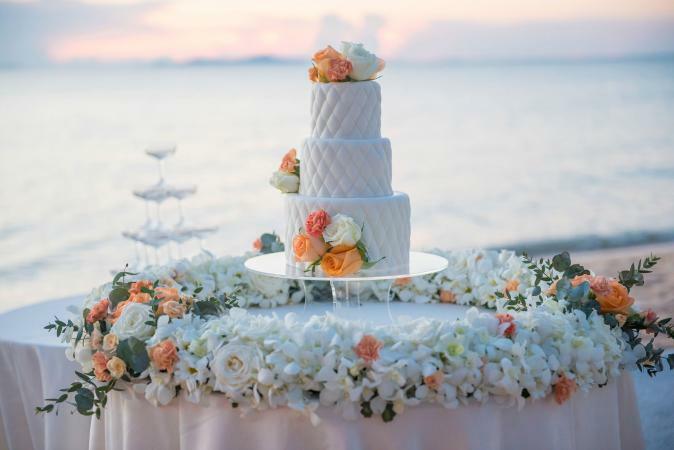 You may also further embellish the final results by applying accents to the corners of the diamonds or by altering the direction of the quilting lines to follow the direction of more haphazard cake designs. If you need help downloading the printable instructions, check out helpful Adobe tips. 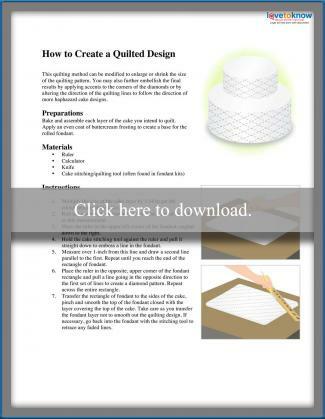 This set of instructions will help you create the pattern right on your fondant before you cover the cake. Click to download the pattern instructions. Bake and assemble each layer of the cake you intend to quilt. Apply an even coat of buttercream frosting to create a base for the rolled fondant. Multiply the size of the cake layer by 3.14 to get the circumference of the cake. Roll out a rectangle of fondant to cover the sides of the cake in this measurement. Place the ruler in the upper left corner of the fondant, angled down to the right. Hold the cake stitching tool against the ruler and pull it straight down to emboss a line in the fondant. Measure over 1-inch from this line and draw a second line parallel to the first. Repeat until you reach the end of the rectangle of fondant. Place the ruler in the opposite, upper corner of the fondant rectangle and pull a line going in the opposite direction to the first set of lines to create a diamond pattern. Repeat across the entire rectangle. Transfer the rectangle of fondant to the sides of the cake, pinch and smooth the top of the fondant closed with the layer covering the top of the cake. Take care as you transfer the fondant layer not to smooth out the quilting design. If necessary, go back into the fondant with the stitching tool to retrace any faded lines. Roll or impress an overall pattern into the fondant before quilting to give more texture to the cake. Cover the quilted layer in luster dust for a metallic shine that makes it stand out. Alternate accents of pearls and flowers on the corners of the diamonds. 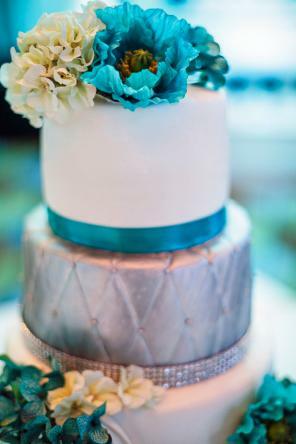 Use the accents on the diamonds as a way to introduce color to the cake. Alternate layers of quilting with layers of other designs, such as smooth sides, scroll work, or florals, to bring contrast to the cake. 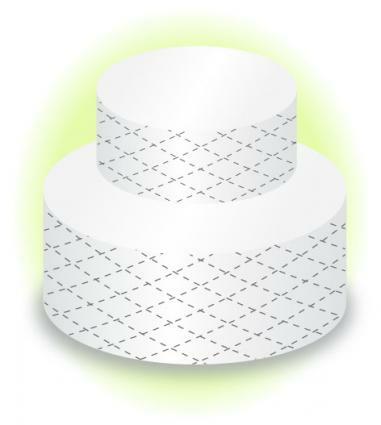 Use unadorned quilting lines that are uneven in spacing to give some texture to more modern cakes. Make every other layer a quilted layer and the opposite layers match each other. This adds interest and offers a contemporary look to your cake. Alternate how deep you impress the lines into the cake on the different layers to make some subtle design differences. 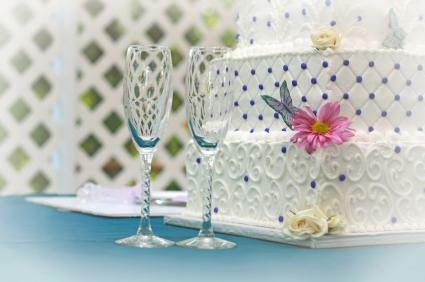 Use a textured tool, rather than a smooth tool, to create the lines in the cake. 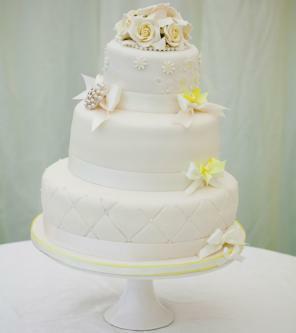 Embossing a quilted design onto your cake makes a wonderful contrast to other, applied decorations on the cake. Add this subtle, elegant decoration to one or all the layers of your wedding cake to bring a little dimension to the finished product.